Remember to check your cholesterol levels and maintain them within desirable limits. Eat a healthy diet. Avoid saturated fats and trans fats, which tend to raise cholesterol levels. Other types of fats, such as polyunsaturated fats, can actually lower blood cholesterol levels. Eating fiber also can help lower cholesterol. Exercise regularly. Physical activity can help lower cholesterol. The Surgeon General recommends that adults engage in moderate-intensity exercise for 2 hours and 30 minutes every week. No smoking. If you smoke, quit as soon as possible. There are two kinds of cholesterol: high-density lipoprotein (HDL) and low-density lipoprotein (LDL). HDL is also called “good” cholesterol. LDL is called “bad” cholesterol. 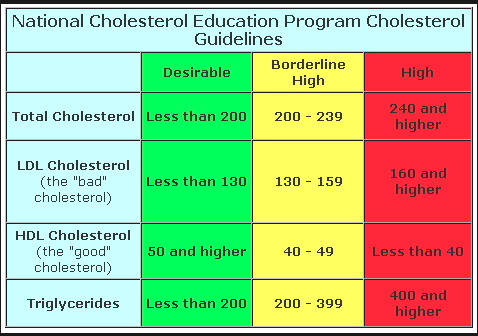 When we talk about high cholesterol, we are talking about “bad” LDL cholesterol. Seventy-one million American adults have high cholesterol, but only one-third of them have the condition under control. September is National Cholesterol Education Month—a good time to resolve to get your cholesterol screened.